Last week in my opinion piece about why I think Android users should consider the Moto X I opened up the article with an admission: I currently use an iPhone 4S and I plan on getting the next iPhone. This wasn’t supposed to be a secret (if you follow me on Twitter then you would have noticed that I use iOS most of the time). On the Droid Life Show I have shown my iPhone and discussed using my iPad. That said, I know that a lot of readers did not know, and more importantly, were surprised or upset to read that I use an iPhone. Below you’ll read my responses to questions I have received about why I use iOS, when I made the transition, and why it matters. If you have follow up questions or comments then feel free to leave a comment or reach out to me on Twitter. You said that there are specific reasons why you use iOS over Android. What are they? iMessage has become the main way I communicate. I use iMessage daily with my wife, my closest friends, and family. It’s simple, works well, and it’s seamlessly integrated with Messages. This might seem like an odd item to put at the top of a list about why I use iOS, but between read receipts, deep OS-level integration, iOS still has vastly superior apps in every category that matters to me. Apps like Tweetbot, Fantastical, Yahoo! Weather, Swipes, Mailbox, Vesper, Day One, and Safari provide a vastly better experience than their counterparts or peers on Android. There are admittedly some apps that have counterparts on Android that are better (Path and Hangouts come to mind), but that has been the exception, not the rule, in my experience. There are definitely apps on Android that let you do things that you can’t do on iOS, but the apps on iOS are better for the things I want to do than they are on Android. Performance on iOS is more consistent than on Android, especially with the passage of time. I’ve owned and used a lot of Android phones, and most of them slow down over time. Android 4.3 might finally solve that problem for the phones that will actually get it, but time will tell. My iPhone 4S is finally now starting to lag once in a while with returning to the home page or swiping between home screens. It appears to be a bug in iOS that creeps up every so often. Outside of that, however, this is the first phone I’ve had that has lasted me two years without having major performance issues. Maybe that can be explained away by inferior hardware on my previous Android phones or OEM skins or the lack of complexity in iOS, but the reality is that I, and plenty of other people, have recognized that Android seems to become more janky with time. I really like Apple’s hardware. Yes, it is more prone to breaking from a fall than many other Android phones, but mine has held up well despite a few falls. In fact, the most recent fall was from about 4 feet on its face and the screen did not shatter (it did take a chip out of the left side of the plastic chin). More to the point, I like the size and feel of Apple’s hardware. The 4S is beginning to feel a little cramped for me, but the 5 feels perfect. I’ve always preferred smaller phones and bigger tablets. The camera on my 4S continues to impress me, the screen is crisp, and the hardware definitely looks and feels high end. iOS is really simple. Your apps are on the home screens and that’s about it. You can customize their location, add folders, and slightly customize the notifications shade, but other than that the experience is dirt simple. I know that a lot of Android users don’t like that, but I love it. While I enjoy customizing my Android phone with different icon packs, widgets, and transition effects, it is more important for me to have my phone work simply and quickly. The idea of simplifying the interface on Android was what brought me to write my first guest post for Droid Life about Launcher 7. So while I like that Android’s interface can be simplified and tweaked like crazy, I enjoy working with a limited palette. I first bought an iPhone 4S about a year and a half ago. My decision to switch to iOS came after spending two years of my contract going from the HTC Touch Pro2, to the Droid Eris, to the Droid, to the Droid 2, to the Droid Incredible. Every one of those devices had hardware or software issues despite being considered top of the line when I had them and most of them had to be replaced multiple times by Verizon due to software and hardware issues. The first time I bought an iPhone actually happened some time before that. MIUI had just come out for the Droid 2 and I was experimenting with it and some other ROMs. At some point late at night I bricked my phone. I was out of ideas for what to do to fix it, so the next afternoon I went down to my Verizon store. I knew what to expect, but I still looked down the shelves of Android phones. Not one of them appealed to me. I was facing phones like the Droid Charge, the Droid 3, and the Thunderbolt. Within a few minutes I wandered over the the iPhone 4 and told the Verizon clerk I wanted one. My then-girlfriend-now-wife was shocked and a little upset. I had bad mouthed iOS for so long, but now I was willing to impulse buy an iPhone? That night I played around the the iPhone some more. I had trouble with the simplicity of the interface compared to Android, but I liked it. I didn’t like that the phone had to be tethered to iTunes (iCloud didn’t exist yet) for a lot of things, but it was a really neat device with a lot of things going for it (especially the app selection and quality). That night I had an idea. I hooked up my Droid 2 that had been sitting dead on my desk and brought it back to life with some combination of SBF and adjusting how the phone connected to the computer via USB. With a working Android phone I had no reason to keep the iPhone, so I returned it. Shortly after the iPhone 4S came out that fall I decided that I would upgrade to the 4S from my Droid Incredible (which I had switched to from the D2) permanently. It wasn’t that I didn’t like Android anymore; it was that I liked iOS for more reasons than I liked Android. Why do you still write for Droid Life if your main phone is an iPhone? I still have plenty of thoughts and opinions about Android, so I still write about Android. 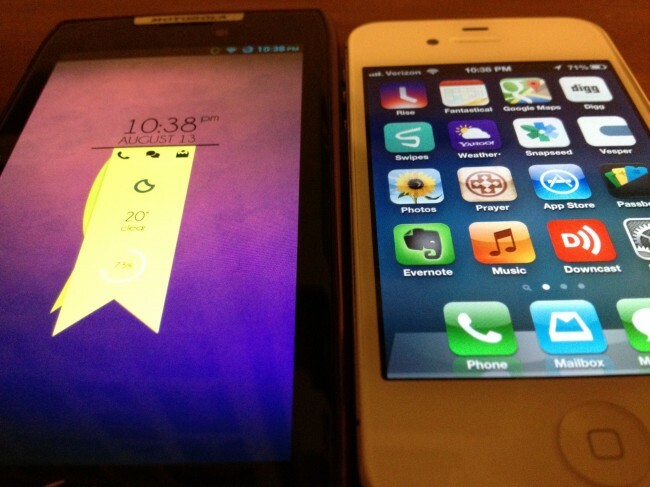 I love my iPhone and iOS, but that doesn’t mean I don’t still love Android (and webOS for that matter). I joined Droid Life to write opinion pieces about Android and Google. In fact, I originally intended on trying to become something like what John Gruber, Marco Arment, and MG Siegler are for the Apple community. When I started writing at Droid Life I was completely dedicated to Android as a platform and completely opposed to Apple. I wanted to evangelize Android and Google. It was Android and Windows enthusiasts’ vehement, unmitigated hatred towards all things Apple that pushed me to play devil’s advocate for some time. Eventually I found myself convinced that iOS was a much better fit for what I wanted in a phone. I didn’t stop being a “power user” or enjoying customizing my phone. Instead, I found that while using iOS I became more productive and enjoyed using my phone a lot more. It isn’t the only way, but Apple’s design and execution philosophies make much more sense to me personally than do Google’s. Having an iPhone just means that I know more about the other side of the fence. If that offends you, then you may as well know that I also own a HTC Touch Pro2, a HTC Trophy, and a Palm Pre 2. While at one point I was hyper-loyal to Android, I see myself as more of a lover of technology in general now. I prefer Apple personally, but I understand why people choose the alternatives: everyone has different needs and desires for the technology they use. That’s completely up to you. If you think owning an iPhones makes me inept at commenting on Android then you should probably just skip my articles. Like I’ve stated many times before, I’m more of a technology enthusiast than an Android enthusiast. If I’m critical of Android or Google, it isn’t because I think the iPhone is better and Android users are stupid; it just means that I don’t like something Google did. If I’m critical towards an Android manufacturer that doesn’t mean that Apple paid me to bash them. In the same way, if I say something nice about Android or an Android manufacturer, that doesn’t mean I’m paid by that manufacturer; it just means I like what they did. I don’t write inflammatory articles to generate more page views or generate more comments. I like interacting with commenters, but I don’t get paid any more or less based on comments and I have no idea how many views my articles get. I understand that some people are upset that I use an iPhone as my main phone instead of an Android phone. I know that my reasons may not make sense to you or jibe with your experience, but remember that objectivity doesn’t exist. We can have different opinions and still discuss Android. So, yes, I use an iPhone and an iPad to write for Droid Life. I also have a drawer full of Android, webOS, Windows Mobile, and Windows Phone phones. I think that makes me less biased towards Android and the competition. Obviously my goal is no longer to become an Android evangelist, but I still love Android and the community around it. I still recommend Android phones to friends and family when I think it fits them best. Having an iPhone doesn’t change that I love Android and love interacting with you, the reader. Thanks for reading and participating in the community!